How often have you tried—unsuccessfully—to spread cold butter on bread or a muffin? The Butter Mill is an innovative (perhaps magical?) device that turns cold butter into a soft spread. 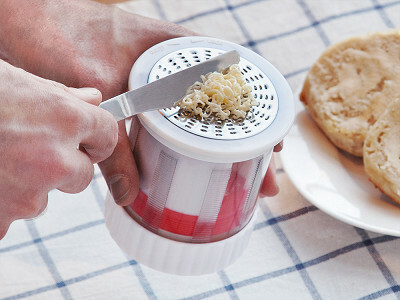 Simply twist it and the butter is pushed through the stainless steel grater into super fine strands. With all that extra surface area, the butter is spreadable almost instantly. When you’re done, store the Butter Mill in the fridge until the next time you need it. From Cooks Innovations, the Butter Mill is just one of their gadgets designed to make everyday life easier in the kitchen. Another of our favorites is the Fridge Monkey. 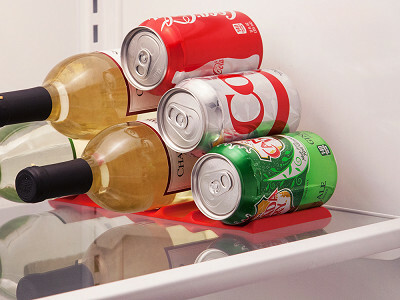 This flexible rubber mat maximizes space in your fridge by stacking bottles and cans. Inspired by the device that reportedly held cannon balls neatly and safely on ships, the Fridge Monkey has just the right amount of give to let cans sit in the cavities rather than roll out over the lip. Stack up to ten cans in a space that would normally fit four. It works for wine bottles, too. With these handy kitchen helpers, your butter and beverages become even easier to enjoy. Hello everyone! 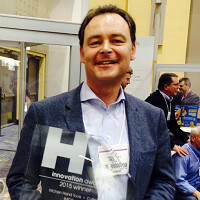 Cooks Innovation is proud to bring both the Fridge Monkey and the Butter Mill to The Grommet. I'd be happy to answer any questions you have. I love these ideas. I do have a question. My mother has had osteoarthritis since high school, and I wonder how difficult it is to turn the grater on the Butter Mill. Is it about as difficult as opening a new jar or a bottle of soda? Harder? Easier? Is it like turning the crank on a cheese grater? Hi Alexandra, the Butter Mill is very easy to turn. Much easier than a new jar or bottle of soda. It takes almost no pressure to turn the butter through the grates. Hope this helps! @Alexandra Hi Alexandra, Turning the Butter Mill is definitely easier than opening a jar or soda bottle. Indeed it's more like turning the crank on a cheese grater. Now, if your mother's fridge is set to a very low temperature, I recommend removing the Butter Mill out of the fridge a little bit before use. It's also best to store the unit in the top section of the refrigerator door. I buy sticks of butter. This appears to hold more of a rectangular butter shape like that of a cream cheese. Can it be adjusted to hold a stick instead? @Dena I noticed the same thing. I was hoping they had invented one that held a typical stick of butter. @Maggie Should work if you put two sticks of butter in side by side. Hi Dena and Maggie, The Butter Mill holds 1 stick of butter. Just cut the stick in half and place one half horizontally on top of the other. The unit is also designed to hold 1 half of the European style butter packs. @You can buy butter in half sticks so there would be no need to cut a stick in half. Genius! I have a butter bell, but living in the south, it's often just too warm. I can't wait to get one of these. @Maggie I am wondering why they don't answer your questions. I am also interested. @ginger I would cut stick in half and stack in side ways? Ginger, you're exactly right. Cutting the stick in half is the way to go. How does this work at the stick of butter gets smaller. Please give us a little more info on how this works. Hi Claudia, it works the same as if it were full. The threads on which the Butter Mill turns go all the way to the top so you should be able to grate every last sliver of butter. @Claudia With every twist, the butter is pushed up against the stainless steel blade at the top, until there is (almost) none left. If, at the end, there is some butter left inside the mill, it is easily removed for spreading or cooking. The Butter Mill is dishwasher safe. Cut your butter stick in half. This should be close to the size of a kerrigold stick or cream cheese slab. Yes???? @candice Yes, cut a 4 ounce stick in half and place one half on top of the other. Some butter brands now also pack their butter in 2 oz. sticks - which makes loading the Butter Mill even easier! @Michelle The Butter Mill and the Fridge Monkey are made in China. @Peter How about cream cheese? Maybe one for butter and one for creamcheese for bagels, also, how about making everything in the u.s.a. we need the jobs. I am starting to buy only u.s. products, think that one thru! Hi Easter, you could use the Butter Mill for both since it is so easy to clean. As far as being made in the US, we respect some people only want to buy products made in the US. But for many Makers, possibly even Cook's Innovations, they want to manufacture here in the US, but it's not always feasible and they need to look for other places to do it. I love this. It really solves one problem that you have pointed out,even though it is a small problem. However, it does help with a larger problem. Using way too much butter because it is cold and there is no air in it. I have seen my husband have three tablespoons on a piece of bread to make toast strictly because it came right off a cold stick. This makes less butter look like more! Much healthier. Now about this China thing! I am fine with Korea, Thailand, Singapore, even Vietnam however China owns us and their politics are heinous. India is great. You might want to rethink it on your next product. @Marlys Thank you for sharing your thoughts! We definitely review our manufacturing options with every new product we develop. Your point about using less butter is absolutely right. And talking about healthy: At least your husband is using real butter - with no trans-fats it is much healthier than many of the other "spreads" out there. @Peter Hi Peter: I think this is a very creative kitchen tool, kudos to you. After reviewing the comments though, I am concerned about this product being made in China. I get that you have manufacturing costs etc so of course it would make more sense to you. However, as a consumer items made in China are off my purchase list. I wish you the best of luck. It would be nice to spread butter in the morning without trashing the bread. Are the stainless steel grates replaceable? Are there other grates that can be used, for decorative purposes? Hi Jason, amen to that! The stainless steel grate is part of the actual unit so it is not replaceable on its own. There is also the one design you see above. @Jason The grate is made of high-quality stainless steel and will stay sharp for years! What color choices are there and how does one select the color choice at check out? Hi Paul, there is only the one color option you see above. Good grief, people! Do you not read the replies BEFORE adding a comment? It's a simple gadget that's not designed to monitor or control your portions of over or under usage of butter. It doesn't come in a variety of colors, and so what if the inventor wants to source out manufacturing to another country. It's plain and simple and nothing more than that...a twist device that shreds butter for easy application. If you like the idea, buy it! If you don't, then don't! Also, please try and think outside the box and figure out for yourself how to stick some butter in it to make it work. It doesn't look that difficult! By the way, great idea, Peter! Not all of us are idiots! @Sheila A little harsh, Sheila. You may not know this, but "replies" don't always post immediately on this site. In some circumstances, it's a timing issue. Ranting like this just makes you sound shrill. Thanks Peter. My Butter Grinder is in shipping right now so I should see how difficult this unique device is to operate in a few days. I will tell you if I lose any fingers or sleep after I have a couple of days of using your great invention. Thanks again! Sheila, you must really be having a hard day! Ease up a little. I plan to buy one, but to call me an idiot if I ask if I have a color choice is a little over the top! Whew! As far as the other questions, take your own advice--if you don't like reading people's questions and it upsets you so badly, don't read them! 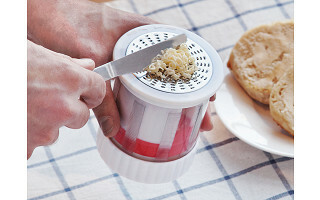 @Paul Light bulb just came on: I use sticks of butter, just use my hand held mini grater and I will have the same result, easy to spread shreds of butter. @Laura PS: I live alone and only I will be eating this, will use a piece of foil to hold the stick of butter; or paper towel, etc. Laura, that is certainly an alternative. The Butter Mill might help save on your foil and paper towel costs though. Everyone else, no one is an idiot, no one is shrill. I think Sheila thought the trend of commenters who tend to ask the same questions as those above (which happens on other products) was about to begin here. The detailed information she is referring to can be found by clicking on the pictures below the video. But I don't want us getting into a game of insult one-upsmanship. For future reference Paul, you can click the picture of the product below the video to see different colors. If there is no color to select at checkout, as is the case with The Butter Mill, it means it comes in the one color you see. Hope this helps! Hello everybody! Remember to check out our FRIDGE MONKEY Bottle and Can Stacking Mat, also launching on The Grommet today. If you have any questions about this unique product, let me know. Thanks! @Peter Probably, except I am 80 years old and rarely cook. Being a depression baby I am at times amazed at the gadgets we think are needed to make our lives easier. Aw, truth be told, I probably would just use my bare hands and wash hands with soap and water, dry with a terry cloth towel after using the grater. If you come to eat at my house I will take you out for a special dinner at a lovely restaurant so you need not worry about germs. Laura, it's certainly one way of getting the job done. I will say, all this talk about dinner at a lovely restaurant might get The Grommet Wholesale team looking for a tradeshow near you! How often have you tried—unsuccessfully—to spread cold butter on bread or a muffin? The Butter Mill is an innovative (perhaps magical?) device that turns cold butter into a soft spread. 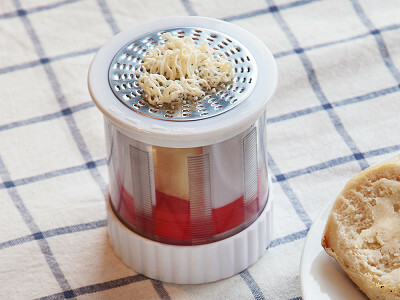 Simply twist it and the butter is pushed through the stainless steel grater into super fine strands. With all that extra surface area, the butter is spreadable almost instantly. When you’re done, store the Butter Mill in the fridge until the next time you need it. 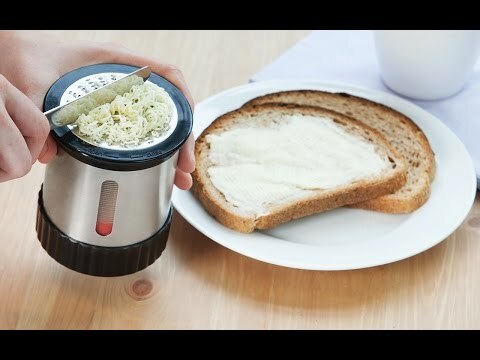 From Cooks Innovations, the Butter Mill is just one of their gadgets designed to make everyday life easier in the kitchen. Another of our favorites is the Fridge Monkey. This flexible rubber mat maximizes space in your fridge by stacking bottles and cans. Inspired by the device that reportedly held cannon balls neatly and safely on ships, the Fridge Monkey has just the right amount of give to let cans sit in the cavities rather than roll out over the lip. Stack up to ten cans in a space that would normally fit four. It works for wine bottles, too.